The first sketch is about how to control PCF8575 PINs. 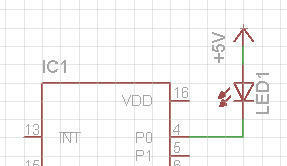 With this connection, the LED will be on when IC PIN is connected to ground, that is logical level 0.
send the two values to the expander. For example, if you connect A0 to ground and A1, A2 to Vcc, the resulting address is 0100110 = 0x26. If you change the builtin address, you can connect more than one IC of the same type on the same I2C bus.